While we cannot predict when the next thunderstorm will come through, we can tell you that your fall insecticide application will last through it. Getting your lawn treated for bugs involves the application of a granular pest control product. Once the product is spread all over your grass, we actually water your lawn to wash the granules down off the grass blades and onto the soil. In fact, if a storm does roll through shortly thereafter, it will just help make sure the product is placed and working correctly. Right now is the time of year when bugs are searching for a place to make a winter nest and maybe lay their eggs. So whatever you do now to protect your property from insects will have the most impact. 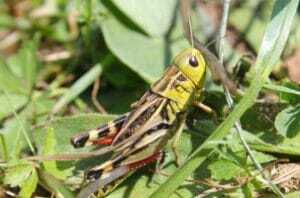 And remember that there are plenty of harmful insects out there who would love to feast on your lush, green lawn. Your shrubs, fruit trees, and flowers probably look mighty tasty as well…. Perimeter pest control products, on the other hand, are liquids that we spray on various surfaces around the perimeter of your property. We usually also apply it on the exterior border of the home and the surrounding soil. While a heavy rain might wash some of that product away, it would take a Biblical storm to remove all of it. Rest assured that having your perimeter treated for bugs right now will make a lasting difference on the insect population in your yard and in your home. It’s definitely not too early to schedule fall insecticide application services for your Atlanta-area home. We can’t count on having cold enough weather to kill off a significant bug population, so it’s up to each of us to protect our biggest investments – our homes – from the creepy-crawly invaders. Insecticide application can easily be added to your regular lawn care schedule, especially if you have a professional company come take care of your grass. 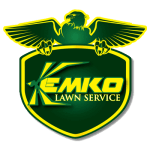 Kemko Lawn and Shrub knows that your home, your family, and your lawn mean a lot to you. We work hard to provide a full range of services that helps you protect all of these precious assets. Don’t worry – right now is not too early to get started with your fall pest control action plan. Call Kemko Lawn and Shrub at 770-466-6113 to schedule your fall insecticide application services.